Overlays the geometries from multiple layers into one single layer. Overlay can be used to combine, erase, modify, or update spatial features. What mines are within abandoned military bases? The department of environmental quality wants to monitor the impact of grazing livestock on the state's water quality. Biologists with the department need to determine where the land deemed to be grazing allotments intersects with certain watersheds. Overlay Layers can be used to find intersecting areas. A development company wants to build a golf resort in one of three centrally located counties in their state. Before they can begin planning, they need to determine whether there is enough privately owned land within those counties that they may be able to purchase for the resort. Overlay Layers can be used to remove the publically owned lands from the selected counties. The input layer and overlay layer must have matching geometry types. Polygon overlay layer (green) and input layer (yellow). Intersecting polygons of the input and overlay layers. B is the intersection of B and 2. D is the intersection of D and 4. E is the intersection of E and 5. 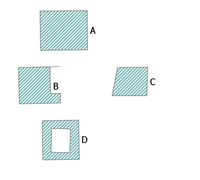 Polygons that are the result of the Erase operation. E has been completely erased, and a portion of B and D have been erased. A and C have not been erased. Line overlay layer (green) and input layer (yellow). Lines that are the result of the Intersect operation. B is the intersection of B and 2. D is the intersection of D and 4. Lines that are the result of the Erase operation. The feature B has been completely erased and a segment of D has been erased. A and C have not been erased. Point overlay layer (green) and input layer (yellow). Point that is the result of the Intersect operation. 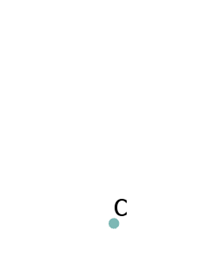 C is the intersection of C and 3. 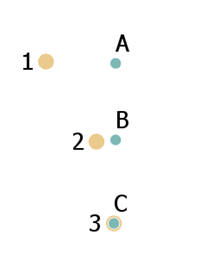 Points that are the result of the Erase operation. The feature C has been erased. 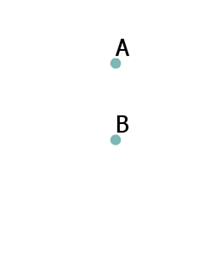 A and B are the result of the operation. The input layer features do not overlap other input layer features. The overlay layer features do not overlap other overlay layer features. You can also set this parameter to false if you are not interested in returning a unique result for each self intersecting overlap. For example, census boundaries would not have any self-overlapping features, and if they were being overlaid to another disjoint polygon layer, you could set this parameter to false. The point, line, or polygon features that will be overlaid with the overlay layer. The features that will be overlaid with the input layer features. The name of the output feature service. The type of overlay to be performed. INTERSECT —Computes a geometric intersection of the input layers. Features or portions of features that overlap in both the input layer and overlay layer will be written to the output layer. This is the default. ERASE —Only those features or portions of features in the overlay layer that are not within the features in the input layer are written to the output. 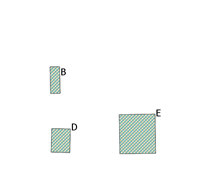 Specifies whether one or both of the input layers have overlapping features. 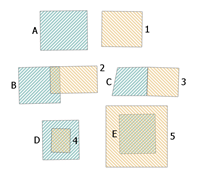 OVERLAPPING —One or both of the layers have overlapping features. This is the default. NOT_OVERLAPPING —Neither layer has overlapping features. Specifies the ArcGIS Data Store where the output will be saved. The default is SPATIOTEMPORAL_DATA_STORE. All results stored to the SPATIOTEMPORAL_DATA_STORE will be stored in WGS84. Results stored in a RELATIONAL_DATA_STORE will maintain their coordinate system. SPATIOTEMPORAL_DATA_STORE —Output will be stored in a spatiotemporal big data store. This is the default. RELATIONAL_DATA_STORE —Output will be stored in a relational data store. The overlay of multiple layers into a single layer. The following Python window script demonstrates how to use the OverlayLayers tool. The coordinate system that will be used for analysis. Analysis will be completed on the input coordinate system unless specified by this parameter. For GeoAnalytics Tools, final results will be stored in the spatiotemporal data store in WGS84.